For any professional chef, there is a certain pleasure derived from seeing a commercial kitchen with all its sleek stainless steel surfaces. 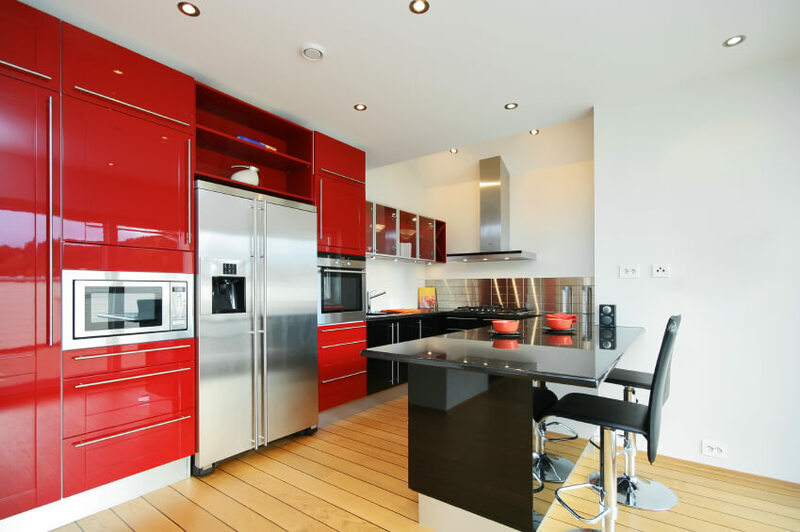 Many modern home kitchens are including more major appliances in this easy-to-clean material. 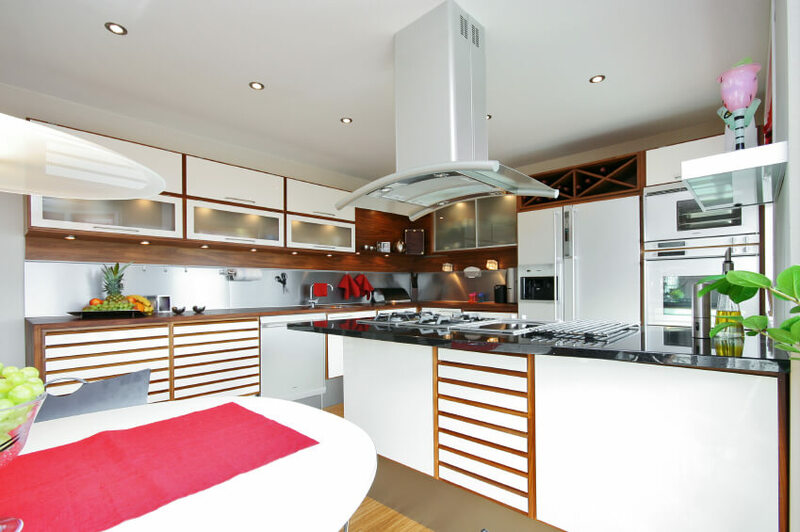 Simple soap and water or a bleach solution followed up with a stainless polish that sprays on and wipes down with ease, and your kitchen environment is the ultimate in clean and ready for action. Stainless steel is well-adapted to any application because it’s so easy to fabricate. Further, it can be textured or even colored for a wide variety of finishes depending upon the look you are pursuing in your kitchen. The electro-polish process infuses color with more than a dozen choices. It can be fabricated in sheets, panels, or even tiles. When applied as a continuous substrate, it eliminates the typical joining that produces cracks or crevices, the perfect environment where bacteria love to grow. This is another reason the material is looked to for keeping large industrial kitchens clean. Without grouting, it’s still possible to effect corrosion-resistant patterns through embossing, pickling, bead blasting, etching, or plating. When installing, there is no worry if your walls are not exactly true. Stainless steel hides many sins. The use of ultra-modern design is offset with warm lighting reflected in the stainless steel backsplash. Space-age appointments and a conventional refrigerator are complemented with the clever use of warm wood accents. You’ve got an excellent example of the classic triadic color combination of red, black, and white with the stainless steel silver serving as part of this color balance. 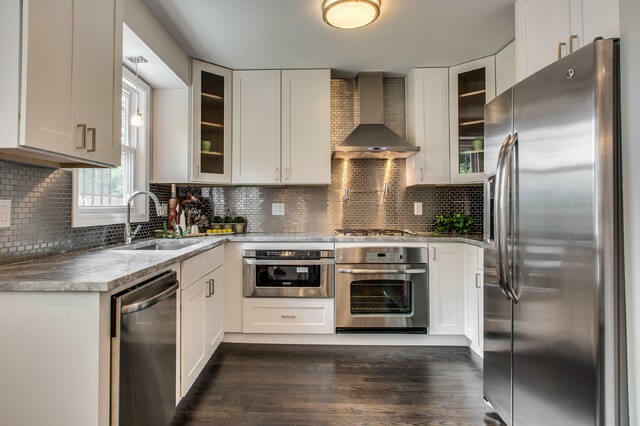 All the surfaces in this kitchen are bright and shiny, including the stainless steel backsplash behind the range. The wooden flooring warms the room nicely. A little different, this example uses stainless steel tiling as a backsplash that runs the full length of this kitchen. It’s quite a stunning appearance. These examples give you some great ideas to get started planning your own stainless steel backsplash. Does a Minor Kitchen Remodel Add Value?